Sturgeon’s Store, on the west side of Main Street, is a one-and-half storey vernacular building situated within the retail business district of the Village of Blackville. 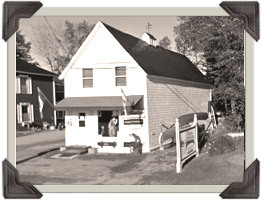 Sturgeon’s Store is designated a Local Historic Place for its association with local resident and businessperson, Jane MacRae. Jane MacRae, a descendant of a longstanding name in the Village of Blackville, was the owner of a nearby storefront and operated it along with her first husband, James Bean and second husband, James Gerrish. Her matriarchal qualities and her astute business sense resulted in the establishment of a compliment of influential properties within the family merchant business trade. This building is also valued for its initial use as Jane MacRae’s ‘outside kitchen’ or ‘back kitchen’. This separate building was seasonally used during warm summer days to prepare the home’s food and harvest while avoiding uncomfortable living conditions and thus denotes a bygone era. It also exemplifies the practice of re-utilization of a building’s function. During a period of local economic growth in the 1940’s, this building was removed by its latter owners from the neighbouring home to its present site and refurbished as a store. It currently functions as a retail sporting goods store and compliments this rural community’s important industry of guided hunting and fishing sports.